Beginning December 2 through December 30, the Gathering Hall will be home to an Art Show of Kay Barks’ paintings. Kay and Bob Barks were longtime members of Grace, as is their daughter-in-law Cathy Barks Watson. You can read more about Kay and her art in the December Friendly Visitor, pages 10-11. Twenty-two pieces total will be included: a graphic print, acrylic and oil paintings, mixed media. 13 Acrylic and oil paintings c. 1960-1970s. Included are five small paintings of scenes from Norway. Three of these (mounted and sold together) are Norwegian houses, while the others are a landscape and a church, all painted from an acquaintance’s travel photographs. Kay’s parents enjoyed these pieces for some time in their home, which is not surprising, since Leif Evans was a Norwegian and Mabel was a Swede! Art will be available for sale by silent auction from Dec 2-23. The show is open anytime the church is open. 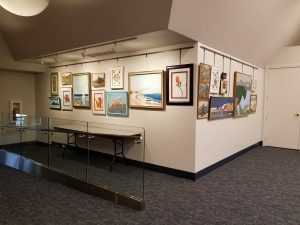 There will also be Gallery Nights for members and the public to view the exhibit: 6-8 p.m. on Tuesday December 4, Friday December 7, and Tuesday December 11. Winning bidders will be notified on Dec 23, and items will be available for pick up beginning on Dec 30. Proceeds will go toward the updating and improvement of the pipe organ at Grace.